I made one of these before with disappointing results. 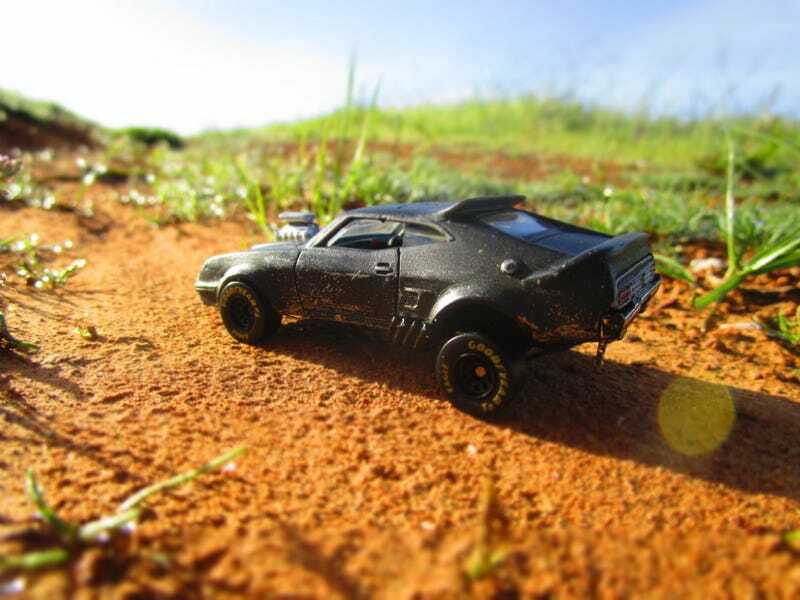 The Interceptor in Mad Max is actually a simple custom because you don’t have to treat it like a glass ornament. Scratches, scuffs and blemishes are okay. This go around came out better than I expected and I feel good for saving a Hot Wheel that was grabbed out of a yard sale toy bucket. This will be a bit pick heavy because I want to include photos of the build so others can copy it or be inspired. My tip to anyone wanting to build one is not to worry about getting it movie car perfect. It’s an instantly recognizable car. People will see black paint and a roof spoiler and naturally envision Mad Max. Only people obsessed with the films will be bothered if things aren’t 100% accurate. It’s 1-64 scale... so accept some limitations. Obviously start with a Falcon XB HotWheels cast if you can find one. The nose jobe came from a 79 mustang by YatMing. filled with JB-Weld and sanded to look right. Simple wire wrapped around the rear spoiler. The Roof spoiler was made of a cut piece of sheet metal. Both covered in JB-Weld and sanded. You can superglue them in place before covering in epoxy. The wheel arches seemed a bit exaggerated on this cast. they were just too long. It looked horrible to me no mater what wheel I placed inside them. The only option was to reshape the fenders to give it a different stance. I super glued some brass wire around the existing wheel arches and covered it in epoxy. once it was dry it was just a matter of sanding it to the desired shape... Like everything else with this custom. The blower was taken off of a HW Way2Fast. Other blowers were a little too small but this one felt right on this cast. The scoop had to be made by bending tin. ‘Sandable’ (Not sure if that’s a word) black primer paint is your friend. Details are up to you.